While sports car companies such as Porsche and Lamborghini are looking to SUVs to expand their offerings, Aston Martin has taken a page from Mercedes and designed a boat. Specifically, it's a 37-foot powerboat appropriately named the AM37. 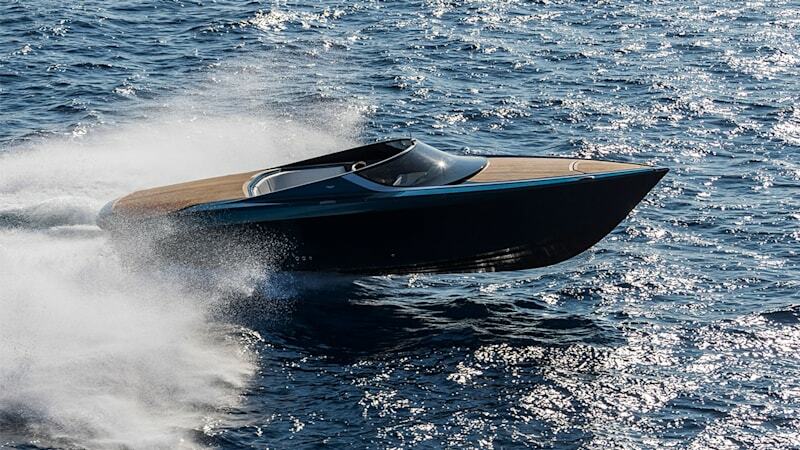 The boat was developed with help from Mulder Design and Quintessence Yachts, and is available in two different versions, both of which should the aquatic equivalent of Aston Martin performance. The standard AM37 is available with two different pairs of engines from Mercury, either 370-horsepower diesel engines or 450-horsepower gas engines. If that's not enough, Aston also offers the AM37S, which comes with a pair of 520-horsepower gasoline Mercury engines. Like road-going Astons, this boat is absolutely gorgeous. The lines are simple, crisp and clean. It features a beautiful wood deck, and an impressive double-curved, single-piece glass windshield. And if you get tired of the sun, the AM37 features a powered, carbon fiber bimini top. The interior completes the package with a carbon fiber dashboard, lots of leather and polished steering wheel, throttle and joystick. It's also incredibly well-equipped with seating for eight, air conditioning, mood lighting, refrigerator, microwave, coffee maker, a bed that folds out from the table, and even a bathroom. Aston Martin didn't release pricing or availability for the AM37. However, we suspect that if you really want this boat and have the means, pricing doesn't matter, and you're probably willing to wait.